One thing that use to be a part of every new race that we did was a race sign, usually made by a family member that was spectating for us. We thought we would share a few of those signs here with you. 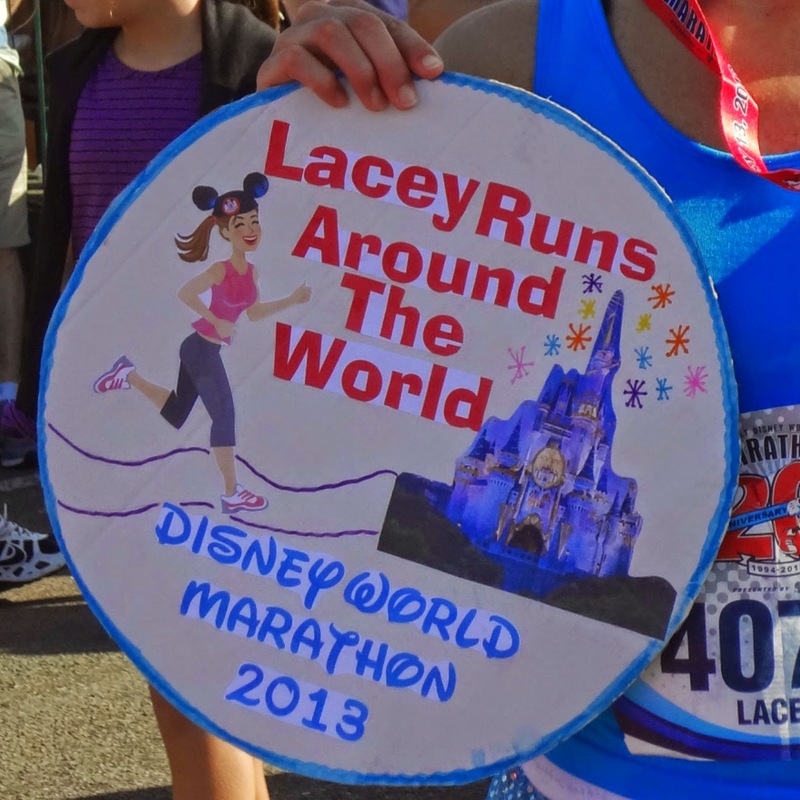 It is quite motivating seeing a sign just for you as you run through the Magic Kingdom! This was suppose to be a 5K dog run that we were going to do along the beach but it got cancelled due to hurricane Sandy. Is there someone in your family that cheers you on at races? Do they make signs? 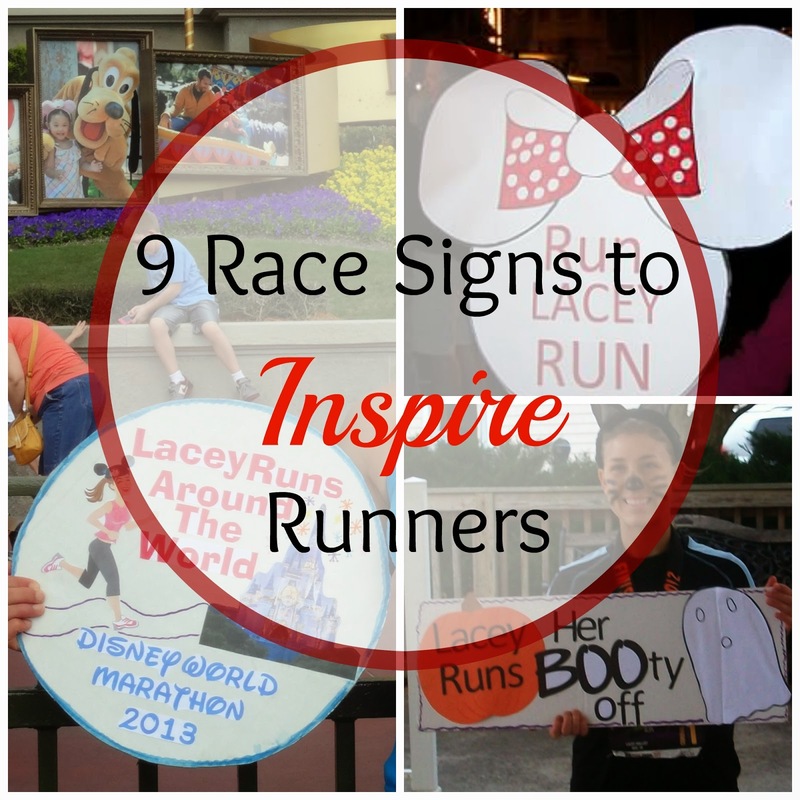 We are linking this post up with TOTR where the theme is Race Signs. Disney signs are the best! Love these signs! Most of the time I don't have anyone cheering because my husband will be running in the race,too. 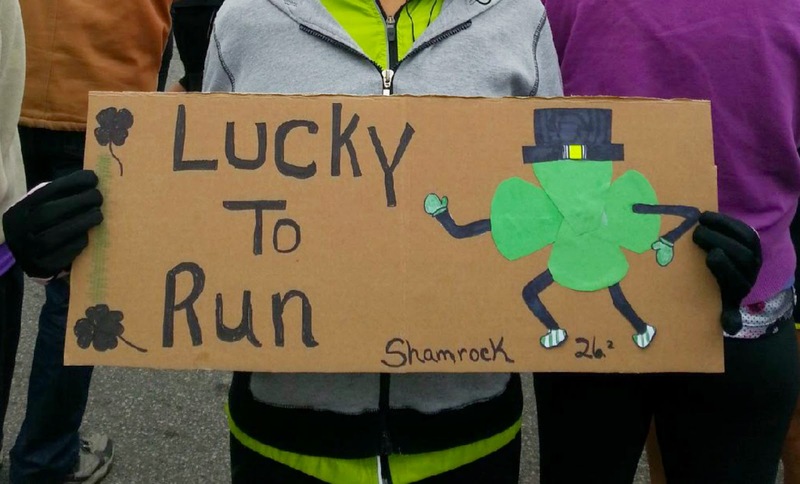 But for my first marathon my friend came with me (she was supposed to run the half but got hurt) so she made a sign and was able to cheer at a few different spots on the course. It was so motivating to see her! I bet that was great being able to see your friend along the course. She probably loved cheering for you since she wasn't able to run! That one is my favorite! No one has ever made me a sign but my husband is usually there to cheer me on! At Boston this past year, he and my cousin were at Mile 21 and they got the crowd near them to chant my name. That was VERY helpful considering I was hurtin' by that point! By mile 21 i'm sure seeing the was a good "pick me up"! I can see why it's great to see a sign with your name on it! It's as if someone is rooting for you personally! Exactly! And it's always fun to see something like that out in the crowd! They provided signs at the Houston Marathon and my husband surprised me along the course with one that he personalized just for me. 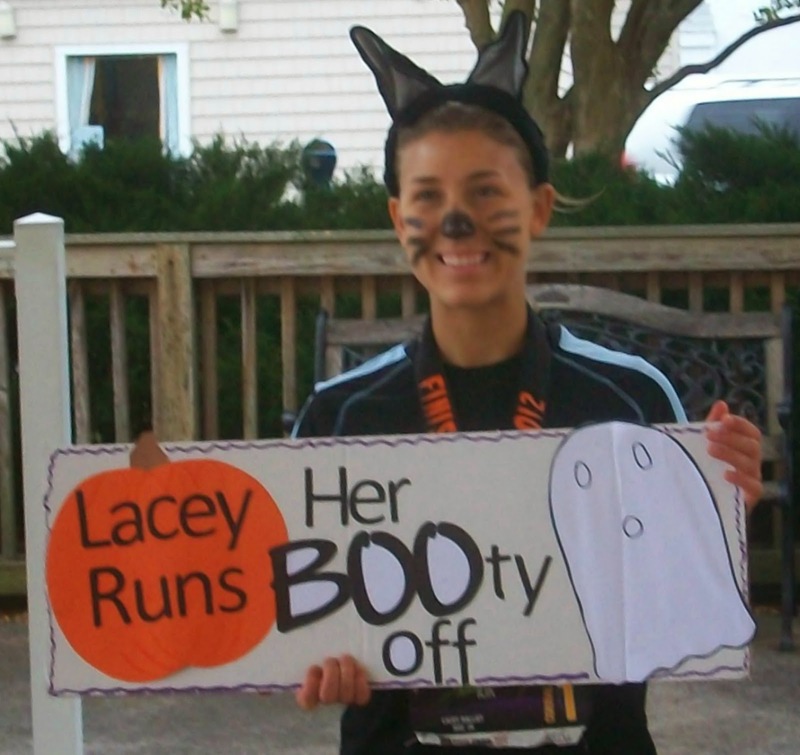 That was my favorite race sign! Oh, I bet that was such a nice surprise! Signs at Disney are great, but then I can never remember a lot of them after the race. I know I've laughed at them but I was so focused during the race I have to look at other people's pictures to see what they signs were. Yes, some are memorable and some were funny at the time but then after the race I couldn't remember them! I'm super--I don't want attention--so if someone made me a sign I would be utterly embarrassed...kinda weird and doesn't make sense! Thanks! I think they are nice to look at no matter who they are for. Not embarrassing at all. I love the "don't paws" sign - that is so cute! Also "Lacey Runs Her BOOty Off" was a GREAT idea! Y'all are so creative. 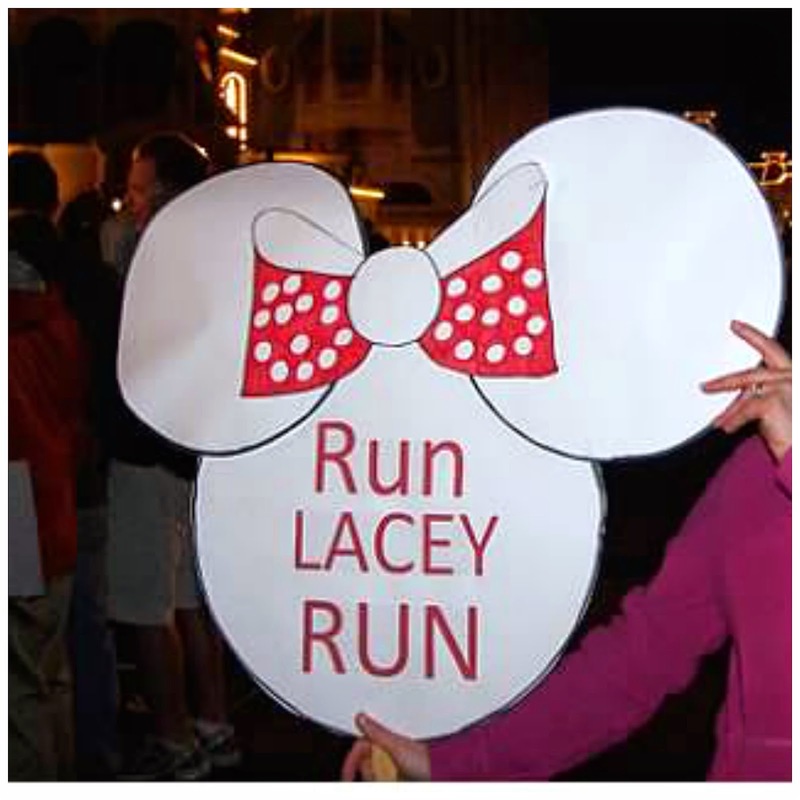 :) My hubby and non-running friends cheer me on during races, but I've never had my own sign...hmm...HA! Thanks so much for sharing, and I hope you ladies have a great weekend! Thank you! Those are two of our favorite signs too. Too bad we didn't get to use the "Don't Paws" sign since that race was cancelled! Race signs are the best! I love all these! 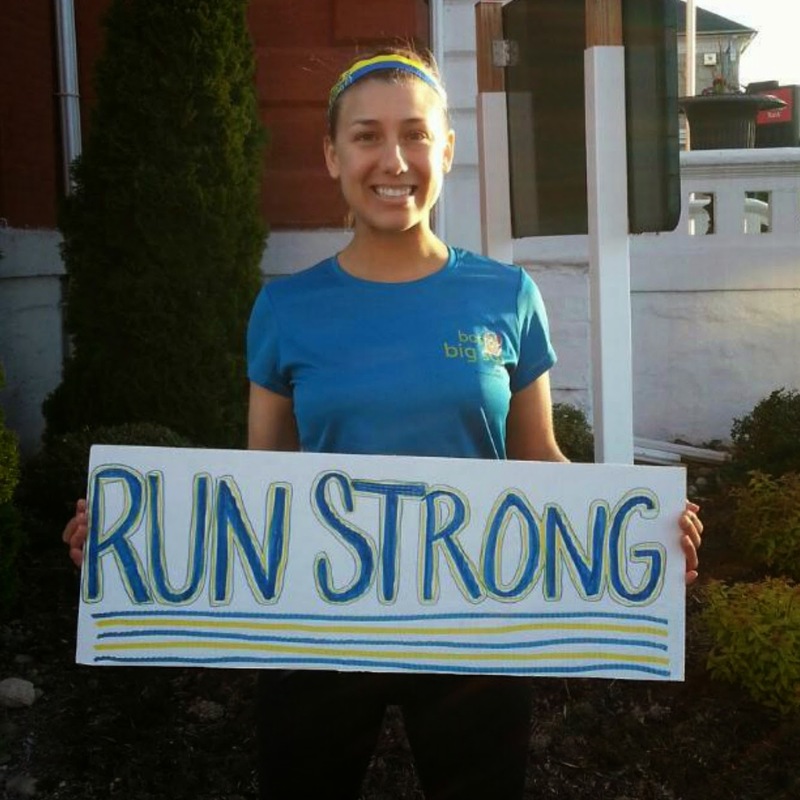 Robert made me a sign for my first marathon back in March which was so motivating! I think I remember seeing that sign! So awesome! I love reading signs in races - entertainment along the way. At least you had your husband cheering! These are so cute! When I did MCM last year, I thought the signs that said "You Run Better than the Government" were hilarious and especially true, considering that the Senate had just restarted after a month of inactivity, and almost canceled the race! I also love the ones that say hilarious things about the people behind or in front of you (like that he's cute, or just farted, or something like that.). Anything to make me lol. Yes, they are all funny! One of my favorites was "in Paul Ryan time, you are already finished"! Found that to be funny last year during the controversy..haha! Those are awesome. My family typically doesn't come to my races because it's a lot of hassle with the little guys, so I've never had a sign made for me :( Sad I know....actually I take that back. 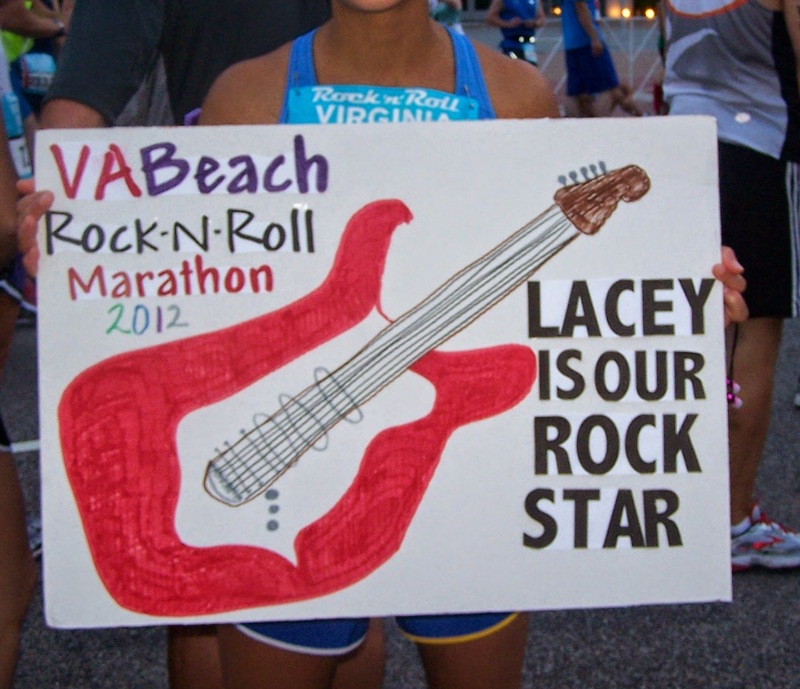 I had a friend who made one for my first marathon last year...it totally got me pumped up!! Having a friend make you a sign for your first marathon is very special. Did you keep it? These are great! My friends and family came out for the Boston Marathon and made signs for me, it was the first time most of them had seen me race, it was so awesome! They also had "Team Sara" shirts made, having that kind of support from all the people I'm closest too was really incredible! Wow, sounds like you had tons of support! These signs are so cute! Love that your friends and family cheer for you! Yes, its a great way to find them in the crowd too! That's so great! At best I get an "I'm proud of you!" at the finish line (which is also great). Sign or no sign, there is really nothing better than a "I'm proud of you" at the end! What awesome signs! No one has ever made a sign for me. Usually my hubby is at home with our boys. On the few races he has come to he has to watch the boys so a sign just isn't a priority. I DO love reading all the signs people have out on the course! Some of them are hilarious! I'm sure having all your boys waiting for you at the finish line is motivating enough! Most of the time we have someone to cheer for us but there has been some races where we are with only each other or running solo! Thank you! We do love our signs! That's great that your family and friends send you encouraging texts during the race. 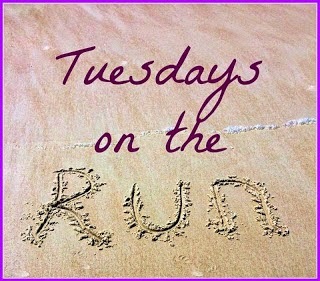 if I tried to read text while running I'd probably trip! Those are some great signs! I love reading all the signs on course, some people are so creative! Your lucky to have such a fun family to do that for you!!!! I have pretty much always gone to my races solo so no signs for me. Most of the races I have run are pretty small so there are very few sign holders in general. I love seeing the little kids cheering on their parents though, so cute! Yes, I love seeing the kids that make signs for their parents! 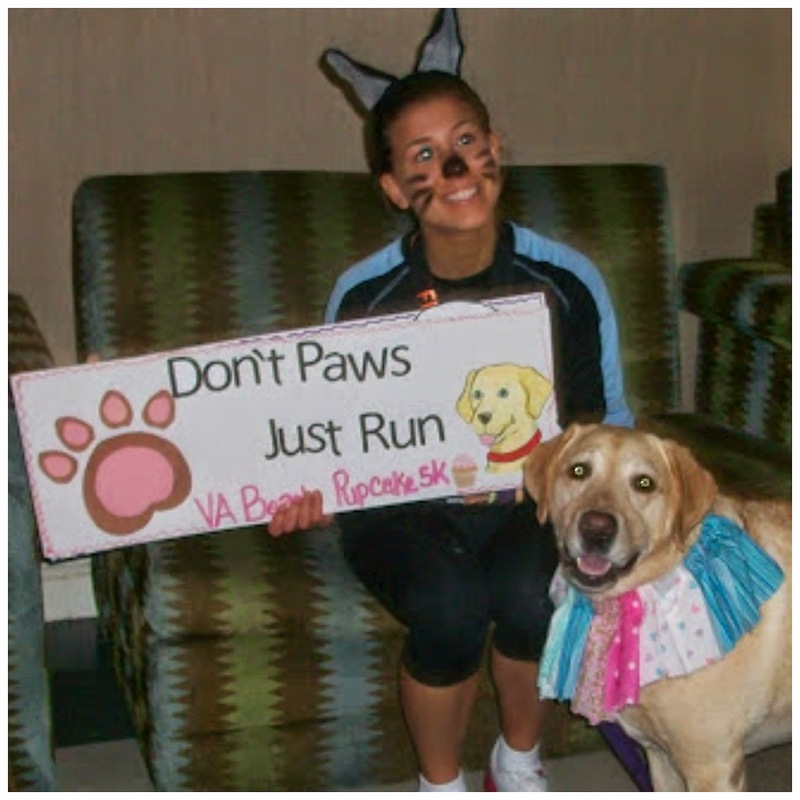 I love all of these signs, especially the "Don't Paws Just Run" one. Too cute! Yea, I think our dog liked that one too! Those are great race signs! I think it's so great that you support each other! Thank April. They are fun to make too! So fun! Looks like you've had a lot of great signs made for you. These signs are adorable!! I love them all, especially the Disney ones! :) You have awesome family support! Great signs! I love seeing signs along the course especially when they make me laugh! Lucky you to have personal signs. I have never had one.